I had the opportunity to host a holiday party and share the Esio Beverage Dispenser with friends. I had not heard of Esio before, but I think they are really going to revolutionize the ready to drink beverage system. I've had drinks from hot beverage dispensers, but never a cold dispenser (other than water coolers). But, the Esio provides hot or cold beverages on demand. Even better, you dial up or down the strength of the beverage. Do you like coffee to be brewed strong or weak? Now you can dial the strength of the brew for each cup. You can have it strong and your friend can have it weak. All in seconds. You don't wait for the water to heat up, it's ready to go. Or, make a cup of hot tea for yourself, a cup of iced tea for your husband, a sports drink for your oldest and a glass of lemonade for your youngest--all in seconds and without mess. Esio has "Drop and Drink" Technology. The custom E-Packs are designed for your Esio Beverage Dispenser. You drop in your e-pack, dial the strength desired, then press blue button for a cold drink or red for hot. I got the multi-serve packs which make up to 14 8-oz glasses of your favorite beverages. After you make your drink, switch to the flavor that others want and pour them a glass, too. The e-packs are self sealing and can be used over and over until they are empty. No need to refrigerate the e-packs. They are shelf stable and last for up to one year. Esio has beverage packs from many different brands. All are low in calories and low in sugar so you can watch your calorie and sugar intake without losing great taste. Here are the many varieties that I received to try. Can you believe all the choices you have? Plus, it is name brand beverages, not generics. 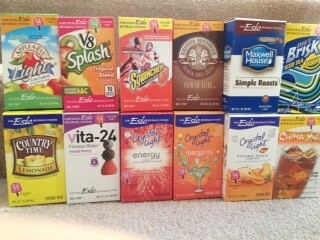 You can get Esio and the e-packs at Walmart or online at Esio Beverages. I didn't even know that Crystal Light made mock-tails. But the Margarita Crystal Light is AMAZING!!! 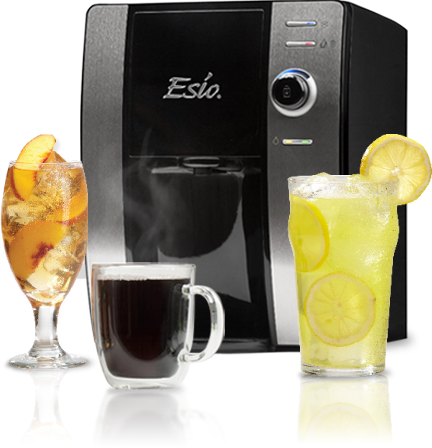 Be sure to check out the Esio Hot/Cold Beverage dispenser at Walmart or Walmart.com or on the Esio Beverages website. Disclosure: I received an Esio Beverage Dispenser for the purposes of this review. All thoughts are my own. This looks like something I'd like to have.